Remote assistance and personalized training for Trimble Ag Business Solutions software users, using secure internet connections or phone calls. Save time and money learning Trimble Ag Business Solutions (formerly Farm Works Software). Get expert help with setup and troubleshooting – save the cost and delays of waiting for classroom training or a traditional on-site visit. Our Remote Assistance enables you to learn faster, easier, in the comfort of your own office. Gain experience working on your own farm records. 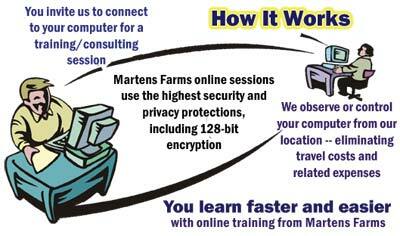 Martens Farms has provided online training since 2004 and we’re confident you will love the results. Martens Farms are effective experts in showing you how to fix problems and improve your record keeping. We work on-screen and talk with you by telephone as we connect to your pc using a highly secured Internet connection. You end up with completed changes to your farm’s records, maps, reports, or software updated. All information remains on your own computer, protected by multiple levels of the highest security, and remains completely private. Access to your computer is granted only after your explicit permission. You see all our actions in real time and can terminate the sessions any time. Cost for Remote On-Site Assistance is $90 per hour, and is billed in 15-minute increments. Call Lorra Martens for more information or to schedule a session.